Store Home > I’m Educated, Now What? I’m Educated . . . Now What? What are the four criteria upon which a job choice should be based? How can menial jobs I have held in the past give me insight into future opportunities? How can I best determine my own strengths and weaknesses? What are the four basic types of work? How can I determine the best industry in which to work? What are the five primary methods for seeking a job? How do I develop an effective 30-second presentation about myself? Can’t I simply “click” my way to a job on the internet? What is a personal marketing plan and what are the steps in developing one? Are you about to graduate from college? 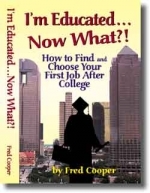 Or, have you recently graduated and simply not found your niche in the world of work? Maybe, you know exactly what you want to do, but you’re wondering, “How do I locate and plug into the best possible job situation for me?” Or, maybe you’re asking, “How do I find a way into that really great company that’s so much in demand, yet so hard to get into?” The book is divided into three parts. Part I will teach you how to evaluate your talents, abilities and goals and find the best career alternatives for you. Part III deals with all of the other methods of finding a job and how you can utilize them to full advantage in your job search. What are the four criteria upon which a job choice should be based. What are the thirty-four questions I should ask yourself in evaluating each job possibility? How do you determine your true interests? How should your family situation help determine your career choice? Should you ever accept a “second best” career option? What are the four types of rewards you should seek from your career? What tests will help me determine the best career choices for me? What are some “common sense” approaches to determine my best career choices? What questions should I ask myself to determine my best career choices? How can I evaluate past achievements that will help determine future successes? How can I harness experiences I see everyday to evaluate what I should do in the future? Is it wise to purse a dream? Can you name some “free consultants” who can help you determine your best path? How can I determine if I majored in the right field in college? What college experiences are most important in determining the direction for my future? How can I determine what job titles I should seek? How can I determine which title options are best for entry level? But how can I find those valuable types of contacts that can actually help me find a job? What are the two primary job markets? Can a shy person network? What are the five reasons why people will network with you? What are the fifteen sources of networking contacts? How do I develop an effective 2-minute presentation about myself? What are networking partners and how can I find them? What are the six objectives in the process of setting up networking contacts? What six points do you need to cover in requesting a networking meeting? Can you have an effective networking meeting on the telephone? What are the eight objectives you should accomplish at each networking meeting? What is the seven point agenda of every networking meeting? What questions should you ask when you seek advice in a networking meeting? Should you present your resume in a networking meeting? What are the follow-up steps you should take after a networking meeting? What mistakes does almost everyone make in following-up networking meetings? Is it possible to network with people I don’t know? What are seven things I can do to get around the barriers to finding network contacts? What are some other uses for networking? How can I use newspaper and magazine ads to best advantage in seeking a job? Can I rely on employment and search agencies to find me a job? How can I best utilize the services of employment and search agencies? How can I best utilize job fairs and trade shows to find a job? When should I pursue a specific company as opposed to a specific job? What are the three types of internships? How can I utilize a temporary employment agency to help me find a career position? What is a personal marketing plan? What are the steps I must take to set up a personal marketing plan? What are seven methods I can use to identify potential employers for my marketing plan? How do I develop a personal marketing presentation? What are the three essential points of a personal marketing script? What does it mean to make an appeal for consideration and how do you do it? What is a mentor and how do you go about finding one? What is the difference between a mentor and a political contact? How can you identify political contacts and use them to best advantage in seeking a job? Fred Cooper is President of Cooper & Associates, an executive search and consulting firm, in the chemical industry. For twenty-five years, he has placed technical, sales and management professionals with companies that vary in size from Dupont to small, closely-held companies. Through his experience, he has gained a unique perspective of the wants and needs of both employers and candidates. Prior to his experience in the search and placement field, he was a hospital administrator for twelve years. Fred is also co-owner of Sing n Learn and author of Ballads of American History, 1001 Writing Projects for Students, Classical Math to Classical Music, and Sing the Word.